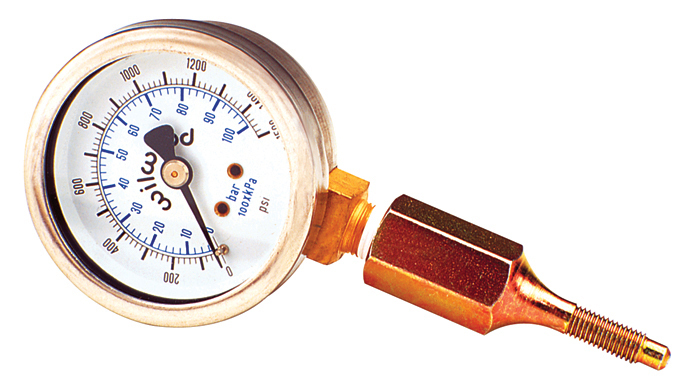 This easy to read two inch diameter non-hazing face allows for quick brake line pressure checks from 0-1,500 PSI (or 0-10,000 kPa). 20 PSI graduations and accuracy to 1.5% permit reliable brake bias setup and brake system troubleshooting. It is durable and corrosion resistant. 5/16" Hose Clamp for Compact Remote Master Cylinders. Replacement 5/8” hose clamp for Compact Remote Master Cylinders. Constructed from durable, high-strength steel. Replacement remote reservoir inlet adapter for Comapct Remote Master Cylinders. Constructed from durable, high-strength plastic. 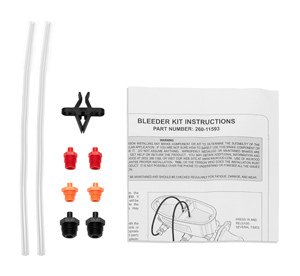 Wilwood's Master Cylinder Bench Bleeding kit contains all fittings and hoses to properly bench bleed your master cylinder, either tandem or single outlet. Bench bleeding is a necessary to assure that system is completely bled and free from trapped air. 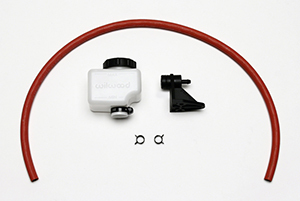 Wilwood's new billet aluminum Master Cylinder Firewall Mounting Kit, part number 250-13167. 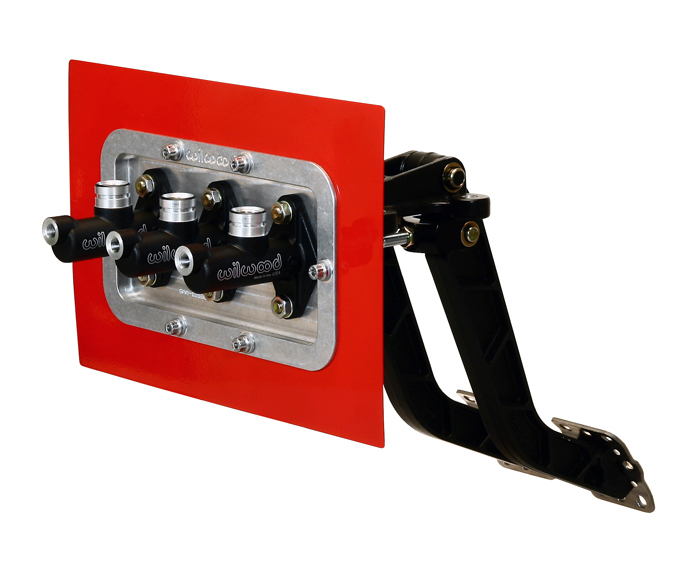 This mounting kit is specifically designed to work in conjunction with Wilwood’s Forward Mount Brake and Clutch Pedal Assembly and Flange Mounted Compact Remote Master Cylinders.The kit allows precision mounting of the pedal and master cylinders to the firewall, and leaves the engine compartment with a high-tech pro-finish look. The mounting plates recess the master cylinder mounting surface by .25”, which allows more clearance in the engine compartment. Both the engine compartment faceplate and interior side mounting plate are media burnished billet aluminum. The kit is designed to accept a firewall material thickness range of .040” - .080”, and requires a minimum flat area the size of the 4” x 8” faceplate. Also provided is all mounting hardware, including attractive, corrosion resistant stainless steel 12 point fasteners, and detailed installation instructions. Remote Inlet Adapter: Combination Remote / Tandem Remote Master Cylinders. Replacement remote reservoir inlet adapter for Combination Remote & Tandem Remote Master Cylinders. Constructed from durable, high-strength plastic. 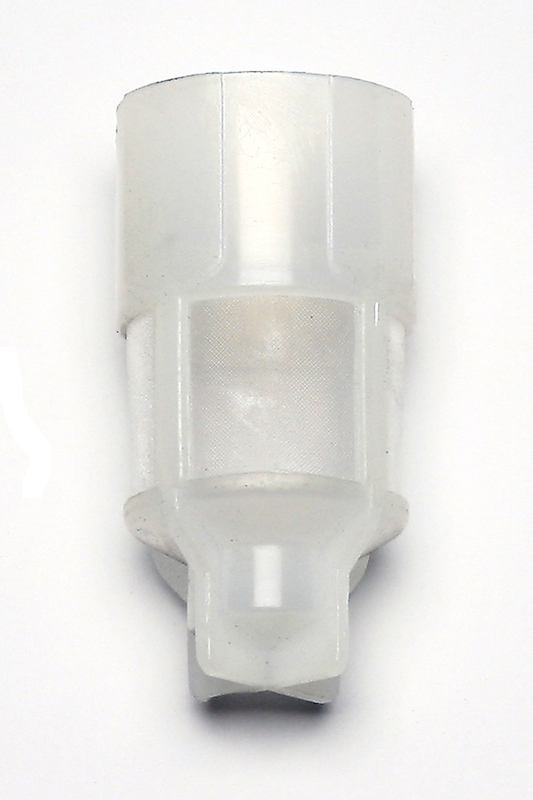 Old style ”prong” type cap, replacement. For older 1st generation Combination Remote & Tandem Remote Master Cylinders. Constructed from a durable, high-strength plastic. 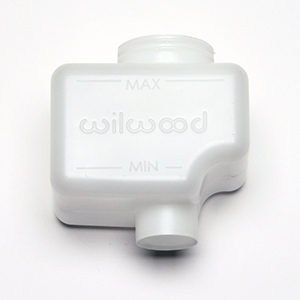 Wilwood's Master Cylinder Reservoir Caps with Electronic Fluid Level Sensors: Checks fluid level electronically and indicates when fluid level needs attention. Utilizes standard automotive 12V DC male terminals for long service life and easy installation of the electrical circuit. 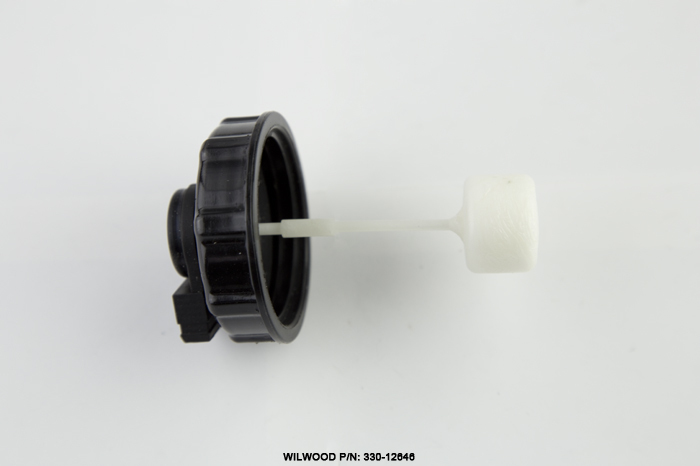 Caps are manufactured from durable lightweight Nylon which has a high melting point and superior color fastness, perfect for engine compartment environments. The internal float is made from a proprietary material,offering excellent dimensional stability to yield accurate readings. Cap diaphragm provides positive sealing and long service life in brake fluid environments. Direct replacement caps for the most popular size Wilwood brake fluid reservoirs. Part No. 330-12645 fits 4 oz reservoirs. Wilwood's Master Cylinder Reservoir Caps with Electronic Fluid Level Sensors: Checks fluid level electronically and indicates when fluid level needs attention. Utilizes standard automotive 12V DC male terminals for long service life and easy installation of the electrical circuit. Caps are manufactured from durable lightweight Nylon which has a high melting point and superior color fastness, perfect for engine compartment environments. The internal float is made from a proprietary material,offering excellent dimensional stability to yield accurate readings. 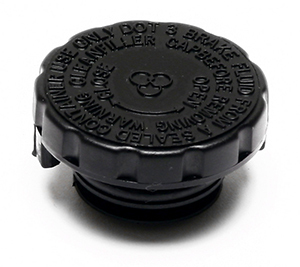 Cap diaphragm provides positive sealing and long service life in brake fluid environments. 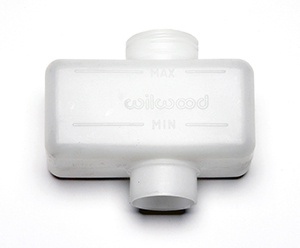 Direct replacement caps for the most popular size Wilwood brake fluid reservoirs. Part No. 330-12646 fits 7, 10 and 10.7 oz reservoirs. Replacement reservoir clamp Combination Remote & Tandem Remote Master Cylinders. Constructed from durable, high-strength steel. 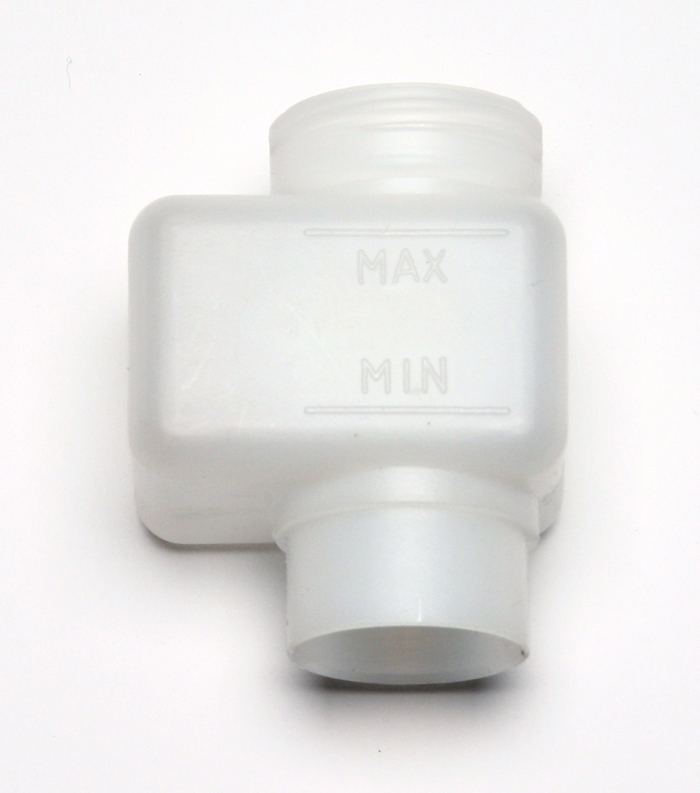 Filter for Combination Remote Master Cylinders, 4 oz Reservior. 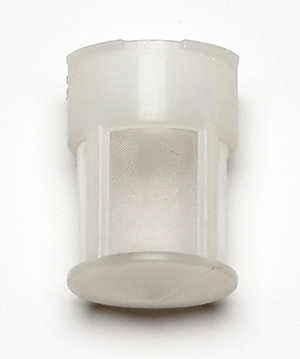 Replacement reservoir filter for 4 oz reservoirs. Plastic construction with a fine mesh screen. Prevents particle contamination of fluid during cap removal. 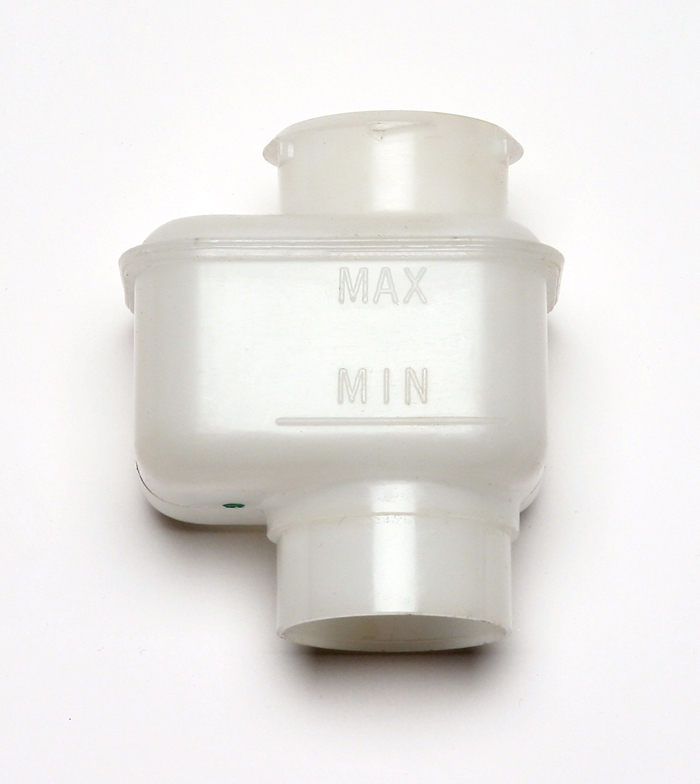 Filter for Combination Remote Master Cylinders, 10.7 oz Reservior. Replacement reservoir filter for 10.7 oz reservoirs. Plastic construction with a fine mesh screen. 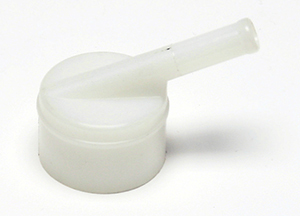 Prevents particle contamination of fluid during cap removal. 4 oz Remote Reservior Kit, w/o fittings. 4 oz. Universal remote reservoir kit without fittings. Also contains reservoir, reservoir cap, remote mount bracket for reservoir mount and 30” of specialty 3/8” hose designed for brake fluid use. Constructed from a durable, high-strength plastic. 7.0 oz. 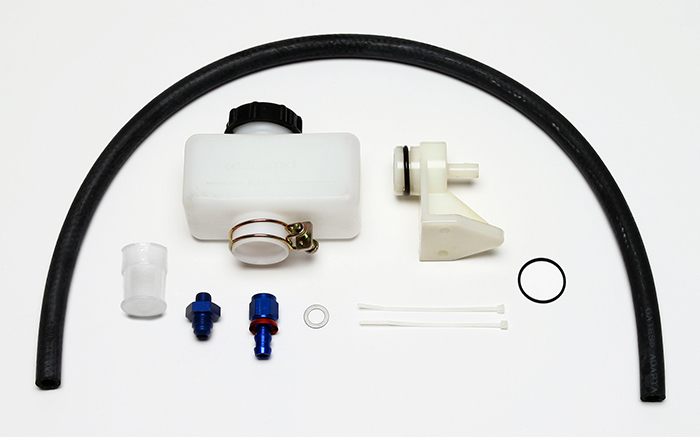 remote reservoir kit for TM1 Master Cylinder. Contains: 30 inches 1/4" ID hose. 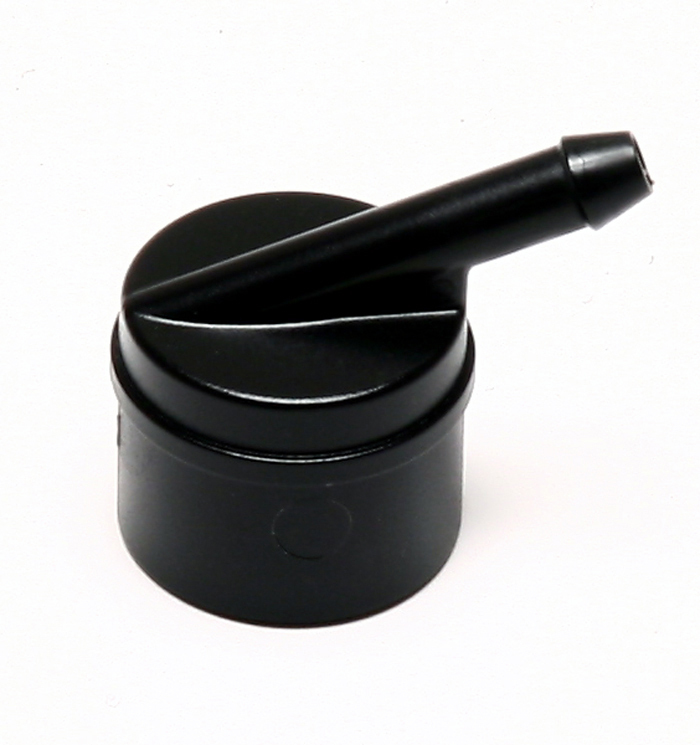 Also contains 1 reservoir, 1 reservoir cap and 1 bracket for reservoir mount. 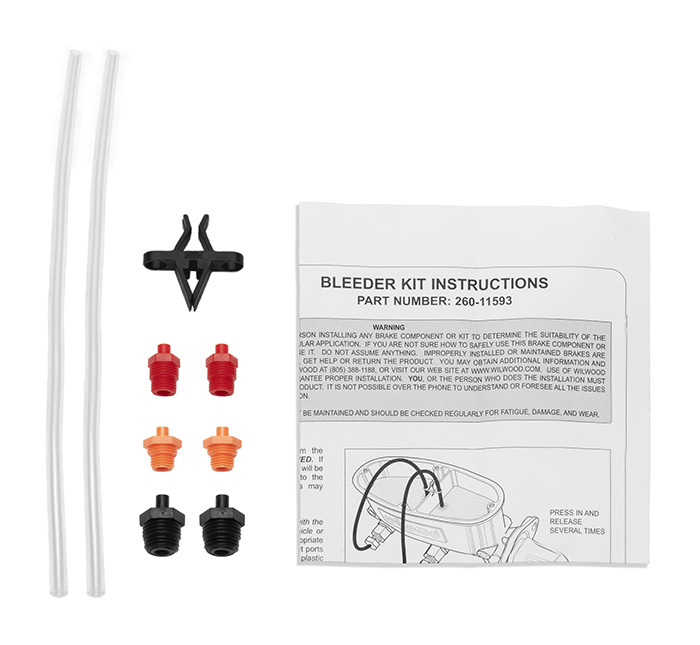 2 kits are required for 1 TM1 master cylinder assembly. Fluid supply hose is a specially designed for brake fluid use and will not swell or leak like other commonly used materials. 4 oz Billet Aluminum Reservior Kit, for Compact Remote Master Cylinders. 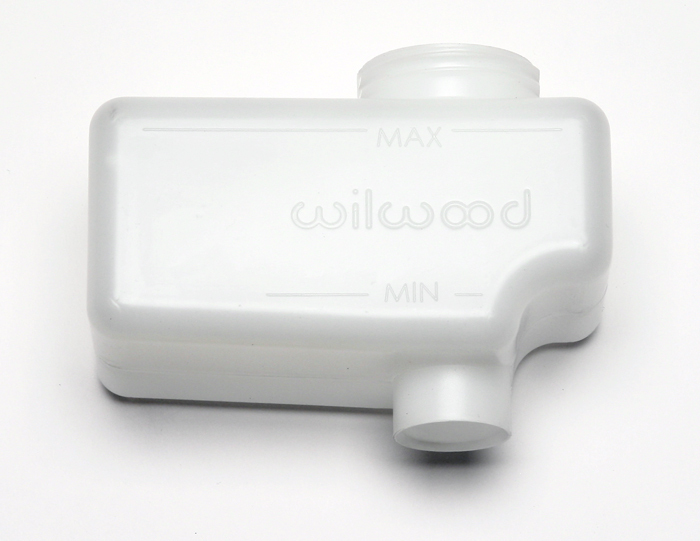 Wilwood's new Billet Aluminum Master Cylinder Fluid Reservoir provides a stylish and durable 4 ounce reservoir that is manufactured from billet aluminum. These reservoirs can be direct mounted to Wilwood’s Compact Remote Master Cylinder body utilizing the internally threaded reservoir support with the 11/16-20 thread adapter (Part # 220-12943) or as remote mount reservoir using the mounting bracket and 3/8-24 thread -3 AN fluid connector adapter (Part # 220-12942), available separately . Stainless steel flexlines in various lengths are available separately for remote mounting. Reservoir kit assembly includes Billet aluminum cap and seal. If replacing the stock master cylinder, additional brake line plumbing may be required. 4 oz Remote Reservior Kit, w/ fittings for Non-integral Compact Master Cylinders. 4 oz. remote reservoir kit for Compact Master Cylinders. Contains aluminum fittings to adapt 7/16-20 master cylinder inlet to 3/8” ID hose. Also contains reservoir, reservoir cap, bracket for reservoir mount and 30” of specialty hose designed for brake fluid use. 10.7 oz Remote Reservior Kit, w/ fittings for Non-integral Compact Master Cylinders. 10.7 oz. remote reservoir kit for Compact Master Cylinders. Contains aluminum fittings to adapt 7/16-20 master cylinder inlet to 3/8” ID hose. Also contains reservoir, reservoir cap, bracket for reservoir mount and 30” of specialty hose designed for brake fluid use. 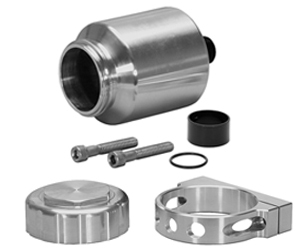 4 oz Billet Aluminum Reservior Kit, for Remote Master Cylinders, w/Bracket. Wilwood's new Billet Aluminum Master Cylinder Fluid Reservoir w/ bracket provides a stylish and durable 4 ounce capacity reservoir that is manufactured from billet aluminum. 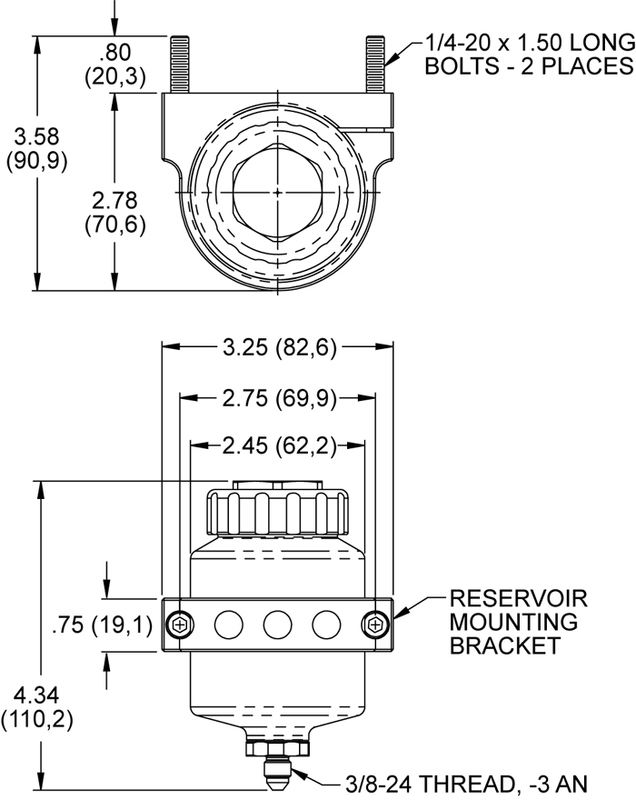 These reservoirs kits are intended be used as remote mount reservoir utilizing the included mounting bracket and the 3/8-24 thread -3 AN fluid connector adapter. Reservoir kit assembly includes Billet aluminum cap and seal. Stainless steel flexlines in various lengths are available separately for remote mounting. 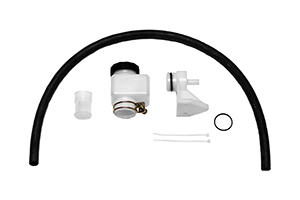 If replacing the stock master cylinder, additional brake line plumbing may be required. 7 oz Reservoir for Compact Remote Master Cylinders. 7 oz. replacement reservoir for Compact Remote Master Cylinders. Constructed from a durable, high-strength plastic. Uses screw type lid part # 330-7641. 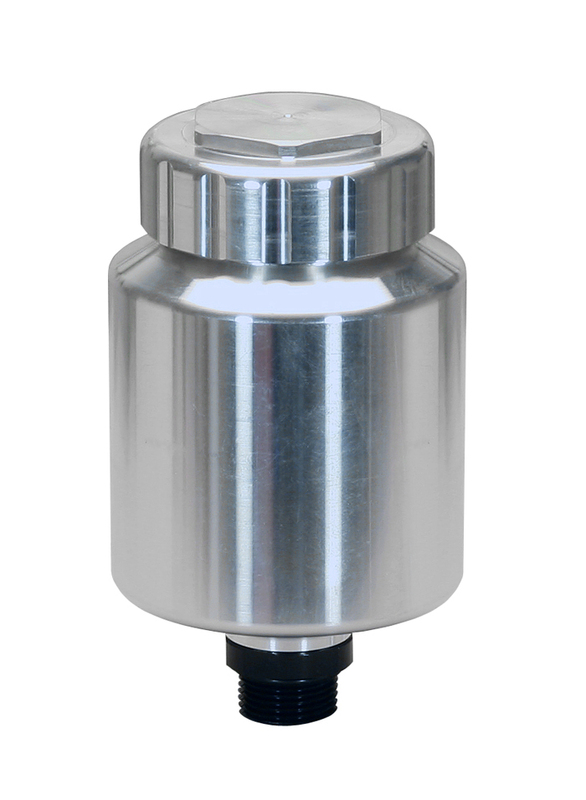 10 oz Reservoir for Compact Remote Master Cylinders. 10 oz. replacement reservoir for Compact Remote Master Cylinders. Constructed from a durable, high-strength plastic. Uses screw type lid part # 330-7641. 10.7 oz. replacement reservoir for Combination Remote Master Cylinders. Constructed from a durable, high-strength plastic. Uses screw type cap part # 330-4355. 4 oz. replacement reservoir for Combination Remote & Tandem Remote Master Cylinders. Constructed from a durable, high-strength plastic. 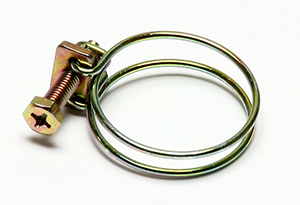 Uses screw type cap part # 330-4355. Old style ”prong” type, 4 oz. replacement reservoir for Combination Remote & Tandem Remote Master Cylinders. Constructed from a durable, high-strength plastic. 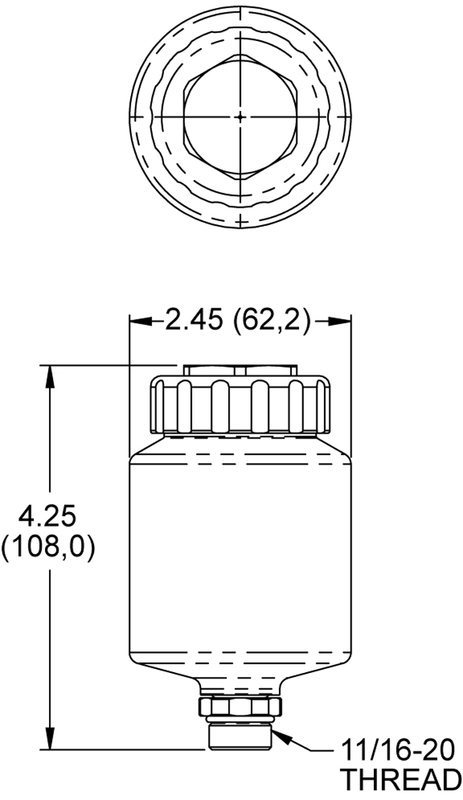 Uses “prong” type cap part # 260-3392. 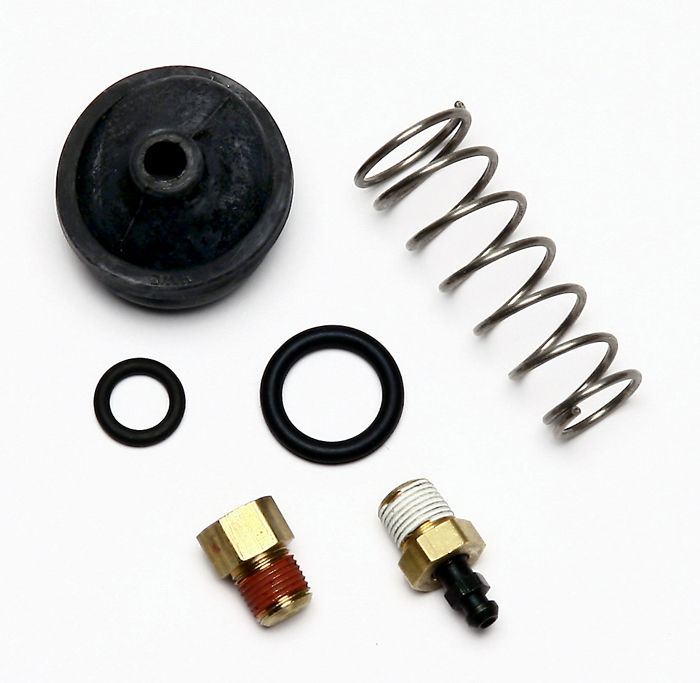 Slave Cylinder Rebuild Kit for 260-1333. Rebuild kit for Wilwood Slave Cylinder. 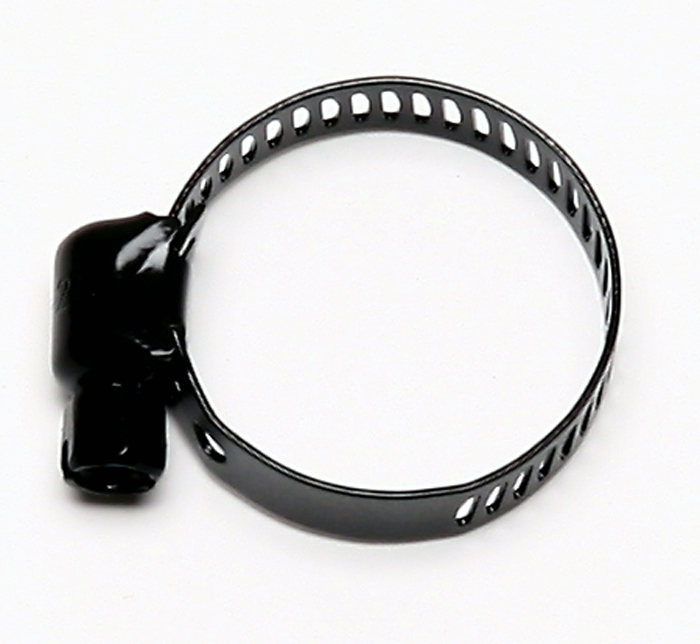 Contains o-ring seals, spring assembly, inlet fitting and bleed screw. All parts necessary for maintenance and repair of your slave cylinder. Hardware kit for Wilwood Tandem Master cylinders. Contains: Fittings, cap screws and spacer for 1.00” and 1 1/8th cylinders. Hardware kit for Wilwood Tandem Master cylinders. Contains: Fittings, cap screws, dust boot and eyelet for 7/8” and 15/16” Mustang master cylinders.